Wifi Heat Map Software & Tools for Site Surveying & Troubleshooting Wireless! Buying a powerful Wifi receiver/transmitter will not necessarily improve your weak signals and dead zones. Getting a pair of Wifi bridges will not always improve performance; on the contrary, they can create signal leakage, which comprises security. Without proper planning and mapping, your wireless network design has a high chance of failing. In a Wireless Local Area Network “WLAN,” the radio wave signals are difficult to grasp and visualize. Wireless signals can be affected by physical objects, radio/electrical interference, and even the environment. A single mirror and a concrete wall can decrease the signal over 75%. How can you know where your coverage area is? Where are your dead zones? How can you tell whether your signal is leaking? What is a Wifi Heatmap? A Wifi Heatmap is a two-dimensional graphic representation of the signal strength in a Wifi network. It shows the coverage of wireless signals in different colors portrayed in a real map of an office layout, floor, or even a metropolitan area. A heatmap also gives a quick summary of information about the wireless network and its connected clients. Having a visual map gives the network admin amazing insights on how to adjust the wireless Access Points “APs” to improve signal coverage and avoid dead zones. 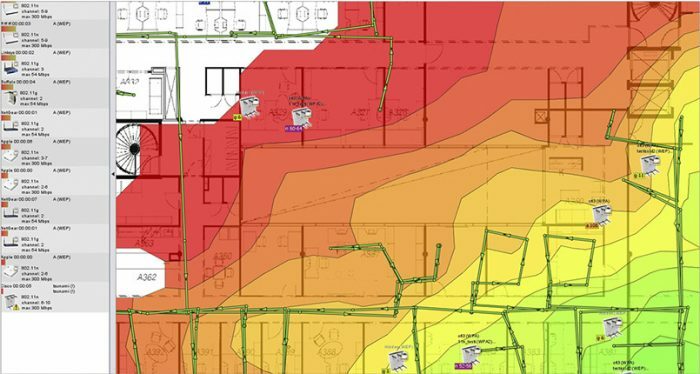 Heatmaps can also help wireless engineers when doing a site survey and planning for capacity. 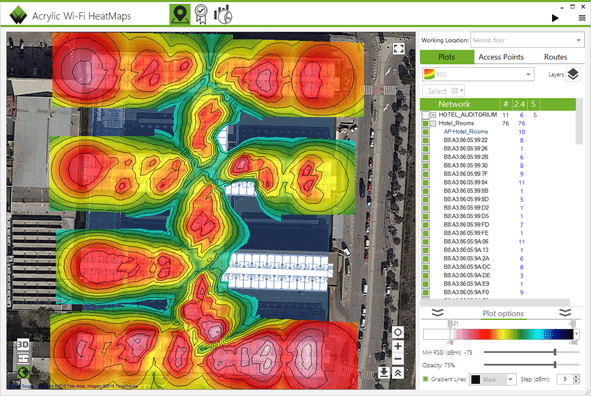 Wifi Heatmap software automates the coverage mapping process. You need to upload an office plan or blueprint, walk around with the connected client to let the software collect data, and the software will automatically create the map. Finding the right software can be challenging. That is why we came up with the six best Wifi heatmap tools to help in your decision. SolarWinds Wifi Heat Map comes with the Network Performance Monitor “NPM,” which is an advanced network and performance monitoring software for on-premises, hybrid, and cloud infrastructure. With the Wifi HeatMap from Solarwinds, you can create custom heatmaps. Start with a manual site survey of the wireless signals so that the tool can record it on the surface of a blueprint or layout. NPM with Wifi Heatmaps will poll the signal strength from clients and APs and generate dynamic Wifi heatmaps. Key features that are Important for this Tool! Find and track the location of mobile clients. With the map, you can visualize wireless coverage, find where are the dead zones, and optimize them accordingly. The tool collects information from APs and their clients and shows their signals in a colored format. Hot (red), represents where the signal is strong, and cold (blue) represents where the signal is weak. The tool is also capable of finding and tracking the location of mobile devices within the map (as shown in the screenshot below). Free fully functional trial of Network Performance Monitor with Wifi HeatMaps from SolarWinds for 30 days. Acrylic Wifi Heatmaps is a site surveying and Wifi planning tool. It is designed to provide WLAN coverage mapping and RF analysis. It can analyze the 2.4 and 5 GHz frequency bands and supports active/passive site surveying.To start a site survey, define the location of the wireless signals. Upload your floor plans or perimeters of a geographical area into Acrylic Wi-Fi Heatmaps. If you don’t have a blueprint, you can create it within the platform. You can draw walls, furniture, and even identify the materials to make it more real. The tool will begin to measure Wifi signal levels, scan for devices nearby (including APs and connected clients), and capture Wifi traffic. With all this information, the tool can create detailed maps showing coverage of each AP. With the collected data, you can also use Acrylic Wifi heatmaps for troubleshooting. You can diagnose problems that affect your WLAN performance and health. Acrylic Wifi Heatmaps is also capable of generating customizable reports. The reports include wireless diagnostics and recommendations on how to improve the network. Use GPS to browse larger extensions. Active/Passive Wifi Survey with iPerf. Acrylic Wi-Fi Heatmaps comes in four different licensing methods. A one month license ($145), three months license ($365), one year license ($990), and Perpetual license ($2480). Try the evaluation version of Acrylic Wi-Fi Heatmaps for 15 days. NetSpot is a comprehensive wireless site survey, Wifi analysis, and troubleshooting application. It is designed for a wide variety of scenarios, from small home WLAN users to large-scale wireless deployments. NetSpot can help you improve the wireless security standpoint by running an advanced analysis. It can also help optimize the Wifi signal strength via heatmaps. To start a site survey with NetSpot, you need to upload your office plan or area layout. Indicate your location on the office plan, and the tool will begin to calculate the wireless coverage. As you move around with your site survey device, Netspot will continue to record data of the signals received in the area, and finally, create a heatmap. The heatmap will give you a visual representation of where the signal is strong and where it is weak. It will also help you to improve coverage, enhance wireless security, and avoid dead zones. A built-in mapping tool. If you don’t have an area layout, you can create one right there. Automatic heatmap. Once you do a manual site survey, the tool will generate a heat map automatically. Discover Mode. Automatically collects information about its surrounding Wifi networks. Real-time Charts. It shows charts of signal level and noise in real time. 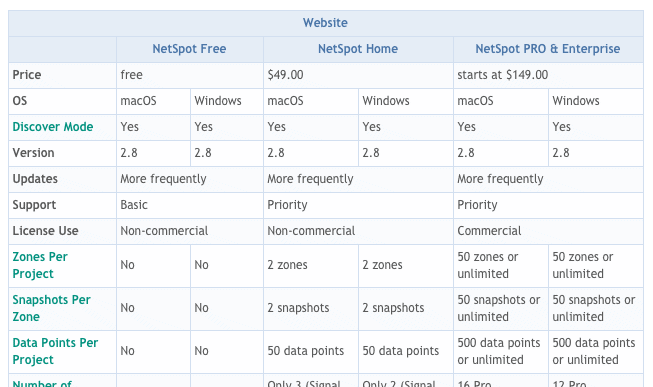 NetSpot is available for Windows and macOS. NetSpot has the following pricing versions – Free, Home ($49.00), PRO & Enterprise (starts at $149.00). NetSpot also offers two versions of the tool through the App Store with a difference in price and features. The Scanner ($7.99) and Reporter $39.99. NetSpot free edition and start surveying your Wifi networks. VisiWave Site Survey is an advanced WLAN site survey solution with data collection and visualization capabilities. It is designed for indoor/outdoor and metropolitan hotspots surveys. 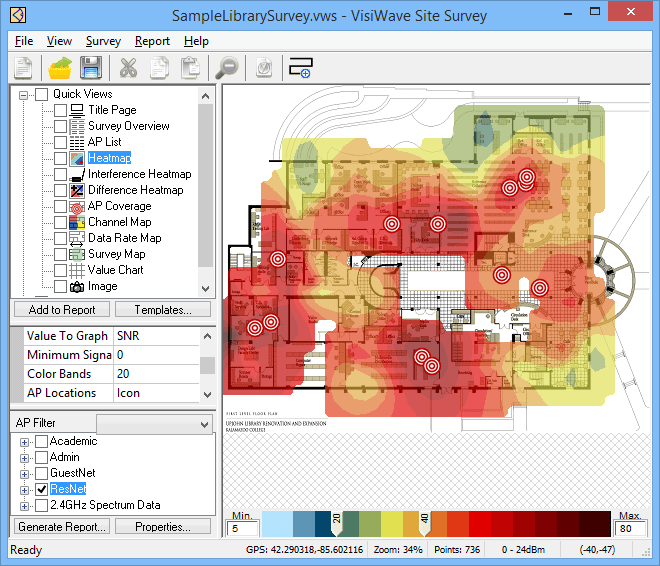 VisiWave allows you to analyze your WLAN, generate coverage heat maps automatically, and display radio waves. This tool is capable of scanning and collecting in-depth data from your WLAN and its surrounding networks. You can also troubleshoot problems related to wireless security, such as detecting rogue APs, or map signal leakage. VisiWave Site Survey can also find and solve issues related to performance, such as identifying dead zones, view channel usage/overlaps, and more. Capture one point at a time. Roam around an entire survey area. VisiWave Site Survey comes with a comprehensive reporting system. You can create customized reports, choose a report template, or visualize your generated heatmaps in Google Earth. VisiWave Site Survey comes in different shapes and sizes. 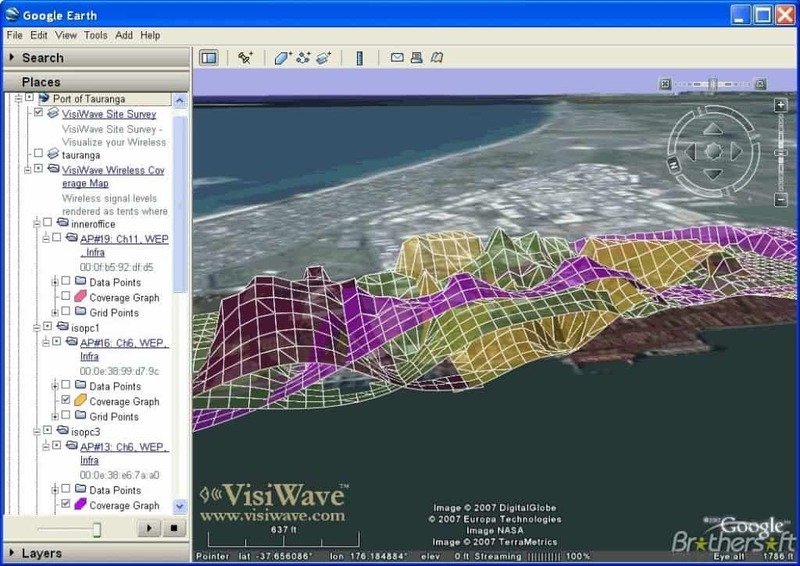 The two most basic products and their prices are VisiWave Site Survey ($549.00) and VisiWave Site Survey Pro ($849.00). Evaluation version of VisiWave Site Survey for a limited time. 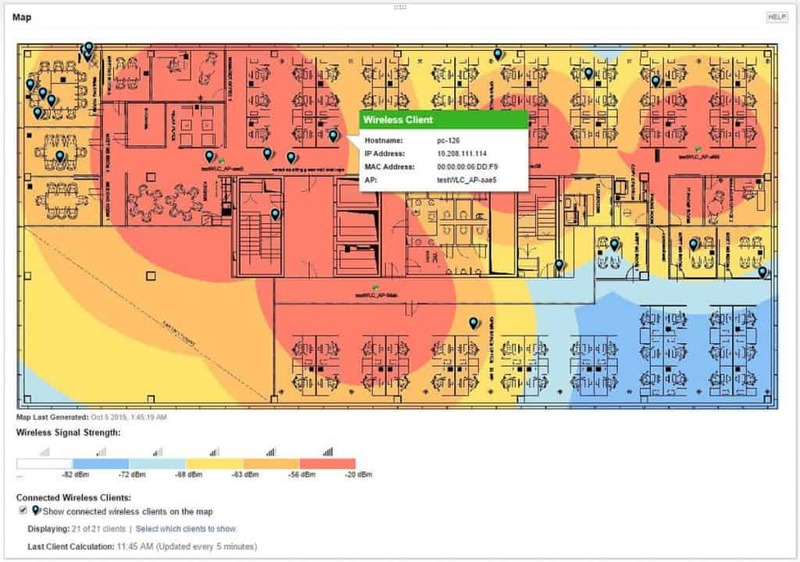 Ekahau HeatMapper is a free Wifi site survey tool designed for small offices and home networks. It is easy to use and installs in a minute. HeatMapper allows you to see the entire Wifi coverage in a heatmap. It can also automatically discover all neighboring APs (including hidden networks) with their security settings. To site surveying with Ekahau, you can upload a floor plan and start moving around. The tool will begin to detect and log the wireless signals and create a heat map automatically. Ekahau HeatMapper is available and works only in Windows OS. Ekahau HeatMapper for free, register on their website. AirMagnet Survey PRO is a wireless site survey solution developed by NetScout. The software is designed for large scale networks and can be used for creating heatmaps, plan for capacity, design WLANs, and improve security. When doing a site survey, this tool goes beyond the traditional wireless scan. 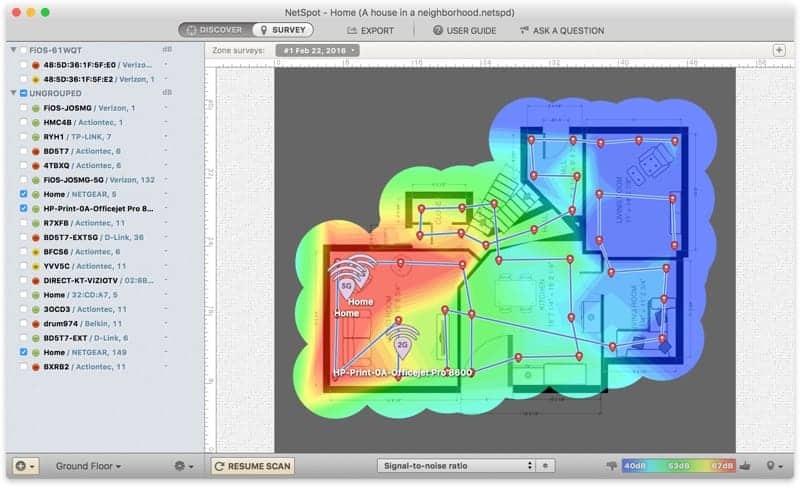 Aside from just analyzing signal coverage, AirMagnet Survey Pro can map out the user’s network performance, by gathering statistics related to bandwidth, network throughput, and packet loss.With this information, the tool can create a Wifi heatmap while displaying important end-user performance measurements. AirMagnet Survey PRO can capture a large variety of survey data and generate heat maps. It can build signal strength, noise, and SNR coverage heat maps. It can also create automatic maps related to channel interference, PHY data rates, packet retry, and more. Integrate with advanced spectrum analyzers. Estimate budget with pre-deployment scenarios. Conduct outdoor site surveys with GPS. AirMagnet Survey wireless site survey software is available in “Express” and “PRO” versions. The price is not on the website, but you can get in contact with their sales team. free demo of AirMagnet Survey PRO. 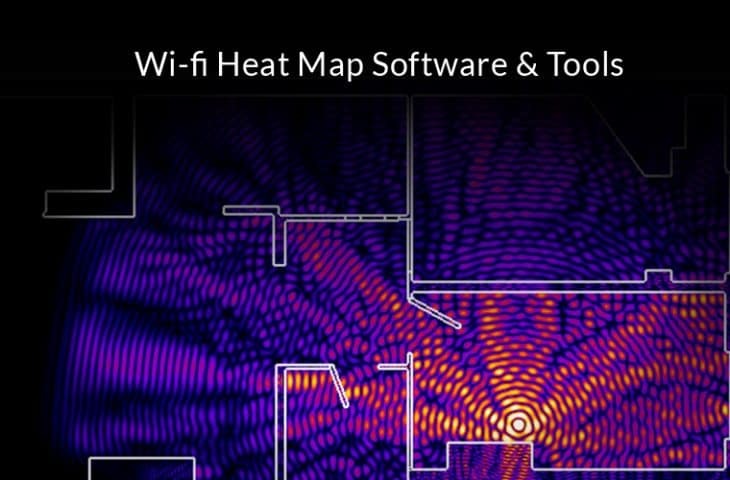 Optimizing Wifi networks can be challenging without the help of a Wifi heatmap. A visual representation of the signal strength can help you find dead zones, improve coverage, find signal leakage, and even track the location of mobile devices. 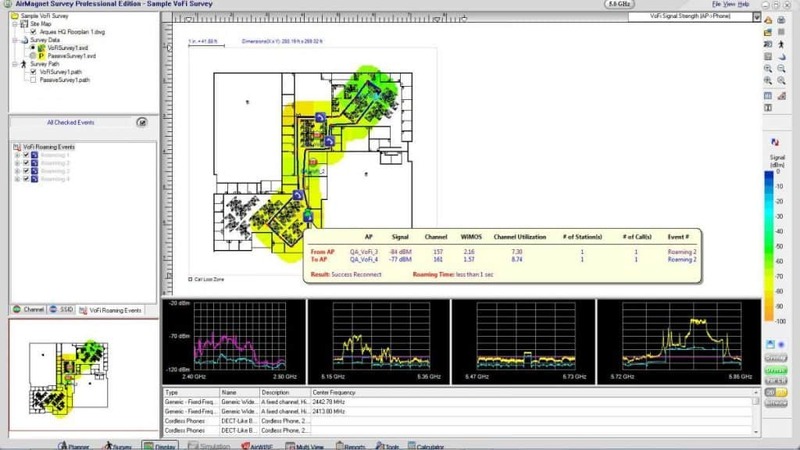 A heatmap is a crucial element when designing and building a WLAN. It will help you perform a proper site survey and plan for capacity. Although the Wifi heatmap software comes at different sizes and prices, they all have the same basic functionality, to collect data and generate a heatmap. All the software showed in this list, have this ability and some others improve it with amazing features. Most of the software have free trial downloads, which is an excellent way to start testing your Wifi networks.